A couple of years ago, I borrowed a pressure canner from a friend and canned as many things as I could. I canned chicken, potatoes, beef chunks and my own homemade enchilada sauce. If you are new to pressure canning, (also known as the steam pressure method) you may want to read this post to determine the difference between pressure canning and water bath canning. 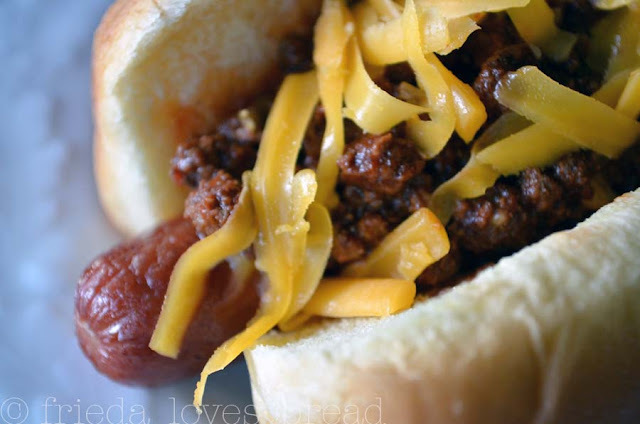 I can't tell you how nice it is to open a bottle of this chili and be able to spoon it on top of this hot dog. Quick and easy, it was a fast meal that didn't heat up my kitchen! 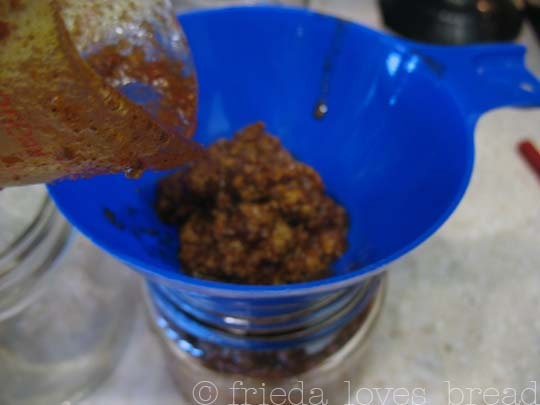 This recipe comes from my canning bible: Ball Blue Book Guide to Preserving. I made a couple of substitutions based on what I had on hand, but I think this chili turned out great! It is a little spicy for me, but my hubby loved it. 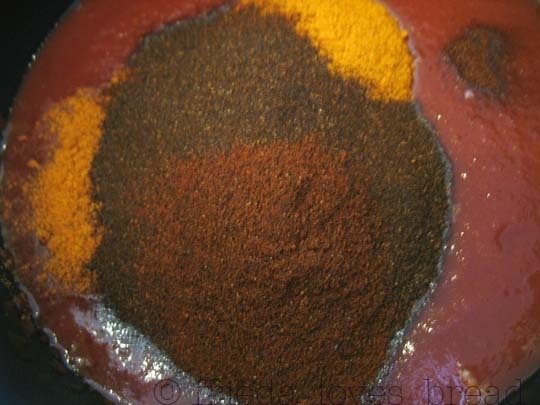 You will need to experiment with the spice levels to get the desired heat that you want. It starts out with 5 pounds of ground beef. I love to use Costco's 91% lean ground beef. 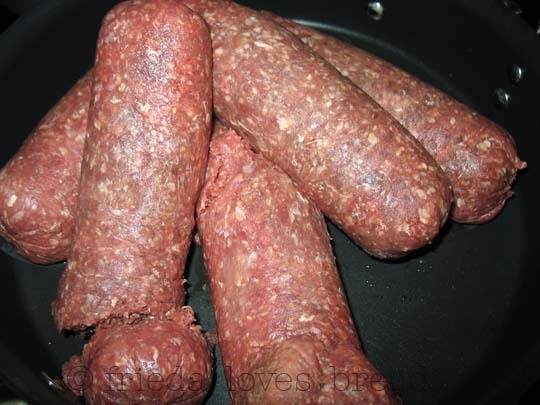 Brown the meat and drain excess fat. Add onions and garlic, cooking until tender. Add canned tomatoes, chili powder, salt, and pepper flakes. Simmer for 20 minutes. I used some bottled tomato juice and cooked it down into a sauce. Ladle hot chili into hot pint jars, leaving 1" headspace. 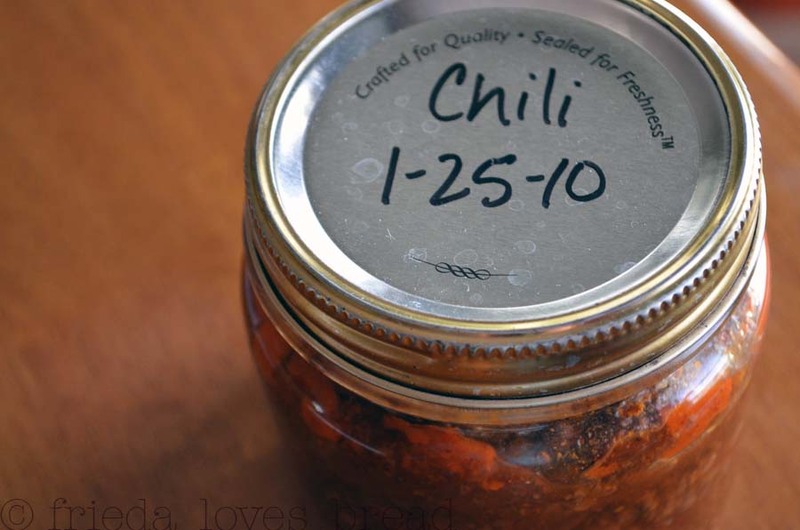 Remove air bubbles in jar by stirring chili with a plastic knife. Clean the rim of the jar to ensure a good seal. 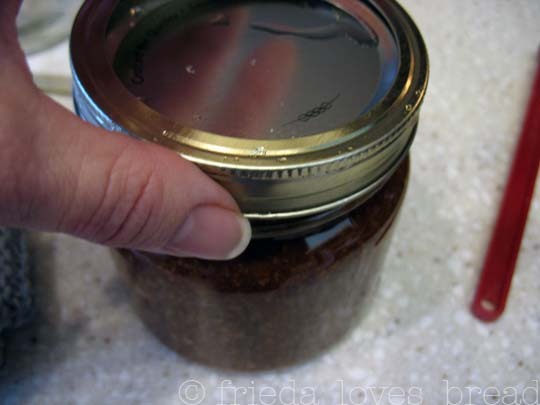 Place a simmered lid onto jar and screw the ring finger tip tight. 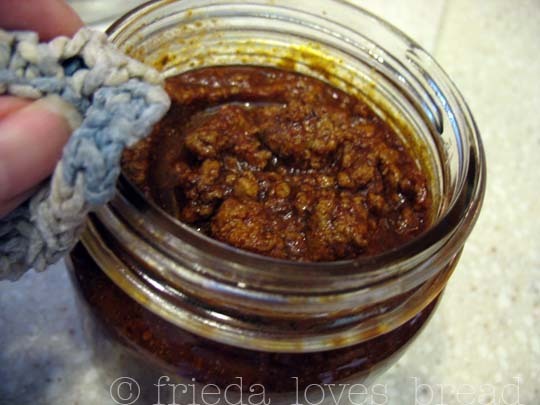 Put prepared jars into your pressure canner. What I really like about pressure canners is that you can "stack" the jars. Make sure you offset the jars, (set the jar over 2 jars) instead of directly on top of the bottom jar. I am not sure why, but the Ball Blue Book of Canning does not recommend canning pinto beans with this chili; instead they recommend canning them separately and adding them to the chili when serving. 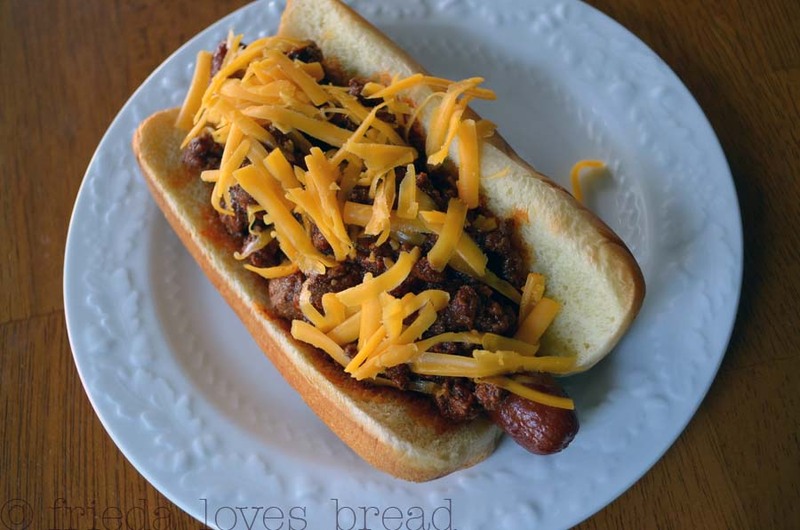 Again, a great recipe to eat alone in a bread bowl or serve with all beef hot dog, topped with shredded cheddar cheese! Thanks for sharing this. Love the post. Thanks a lot for sharing. 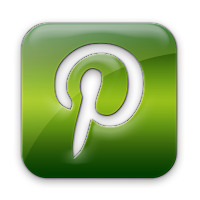 Really helpful article. I used to can EVERYTHING, including chili. 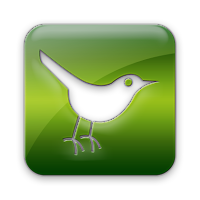 It is so nice to have things on hand, ready to go, and homemade. 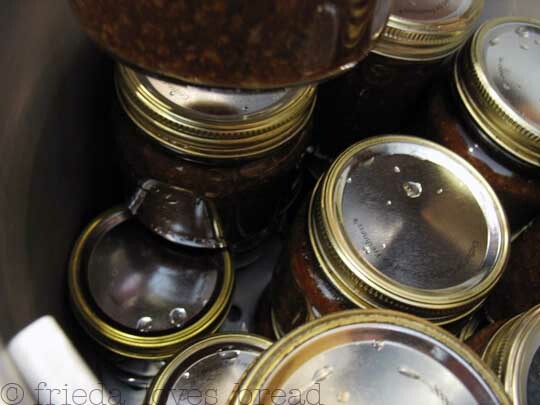 This looks like a great recipe and I do believe that it is high time for me to get back to canning. I agree with you about the Ball Blue Book Guide to Preserving; great resource. Thanks for the inspiration!